Last season, Adrian Peterson was able to play in one game for the Minnesota Vikings before his world was turned upside down. 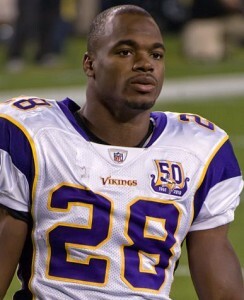 After being indicted for child abuse, Peterson was held out of the rest of the 2014 season. One of the top overall running backs in the game began to wonder if his mistake was going to cost him the rest of his NFL career. He is not reinstated yet, but he is closing in on a new deal that will allow him to become an eligible player. This week, the NFL and Peterson are supposed to meet to see if he can be taken off the NFL commissioner’s exempt list. The soonest he could be reinstated into the NFL is April 15, and that is what he is going for right now. If he does become eligible, Minnesota has a pretty big decision to make in general. They seem to be split on him right now as far as they should keep him whether or not around. He is certainly a very talented player individually, but at the same time there is going to be a good amount of controversy surrounding him. They might be better off without him as far production is concerned, but it could help their young team move forward. The 2 teams who have been linked to Peterson in trade rumors have been the Dallas Cowboys and the Arizona Cardinals. Both teams were in the playoffs last year, and obviously he would be a boost to their offense. They seem to be more than willing to take on any backlash that might occur from fans who might not agree with how things have been handled by the NFL. He is getting up there in age as a running back, but taking most of 2014 off might actually help him stay around in the NFL for a high level for a little bit longer. Ready to try the one-day fantasy site everyone is talking about? Click here to receive a fanduel promo code which will give you a 100% deposit bonus on your first deposit.